Happy birthday (month) to meeee! One of my favorite perks about my job is that for the first Wednesday of every month, we celebrate the birthdays for that month. 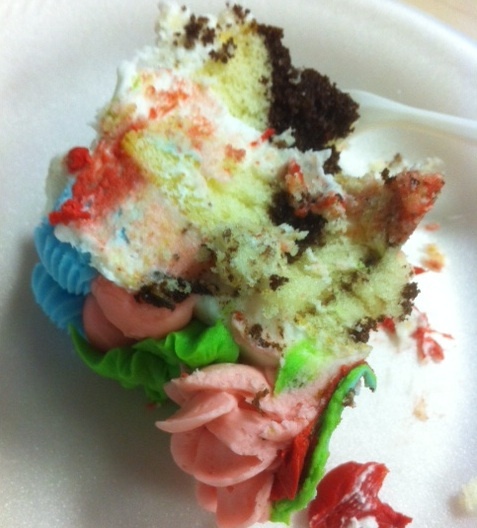 So, Wednesday of this week we had birthday cake for ME!…and one other employee. But I felt like this cake was just for me. It was coincidentally my favorite. Marble cake with white frosting and lots of icing flowers. 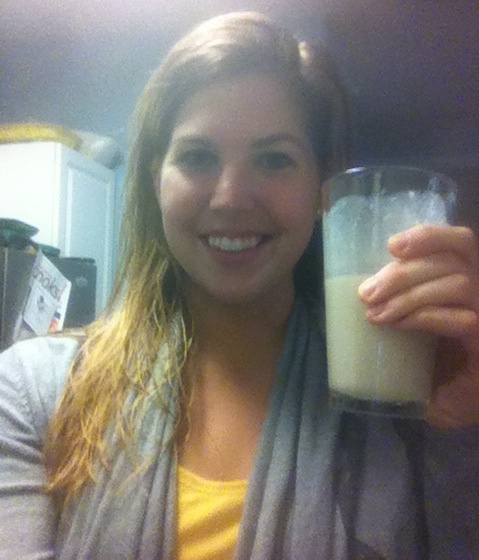 I am very happy drinking these shakes, as you can tell. They are great for breakfast and/or a post-workout snack. My schedule is all kinds of thrown off, because I’m now working unusual shifts at work for the next several weeks. I’ve probably mentioned this before, but in case you missed it, since my company sells educational software, our schedule pretty much revolves around college/university academic calendars. So the beginning of each semester is a very busy time for us and we have extended support hours. I will work 8-5pm one day, 1-10pm the next, 9-6pm another day…etc, etc. Anywhoooo, this has been causing my regular meals and snacks to be off schedule too. After my shake yesterday morning, I snacked on a granola bar at my desk and somehow made it to almost 6pm (without a lunch) before I could take my break at work. I headed home for a quick dinner before heading back to work for a couple of hours. 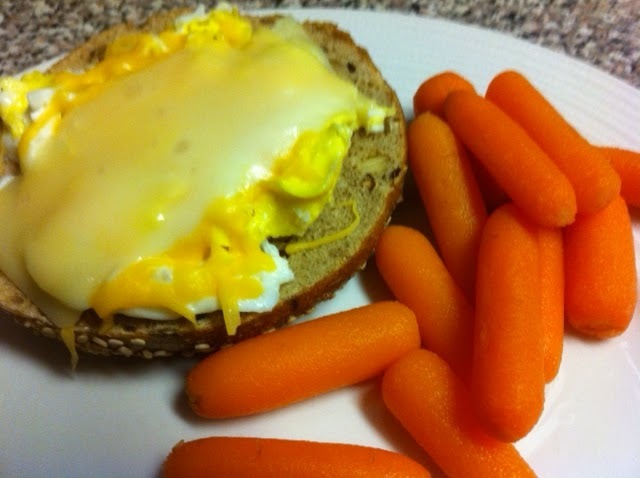 Inspired by Julie’s post at Peanut Butter Fingers, I went with egg and cheese on half of a wheat sesame bagel with a side of steamed baby carrots. Julie is always eating egg and cheese on bagels or english muffins and I drool looking at them. So I finally made one for myself. Bagels are so good, aren’t they? I just wish they weren’t so high in cals. Those bagel thins just don’t do it for me. But then you top it with caramel sauce and it loses some of that healthfulness. Whoops. Tonight Greg and I have a special, unique meal planned. I’ll share that tomorrow (if we’re still alive…)! Did I scare you with that? Don’t be scared, I’m sure we’ll survive. It’s just going to be an interesting experience to say the least. 1. Combine all ingredients in blender. Pulse 1-2 minutes, scraping down sides as necessary. 2. 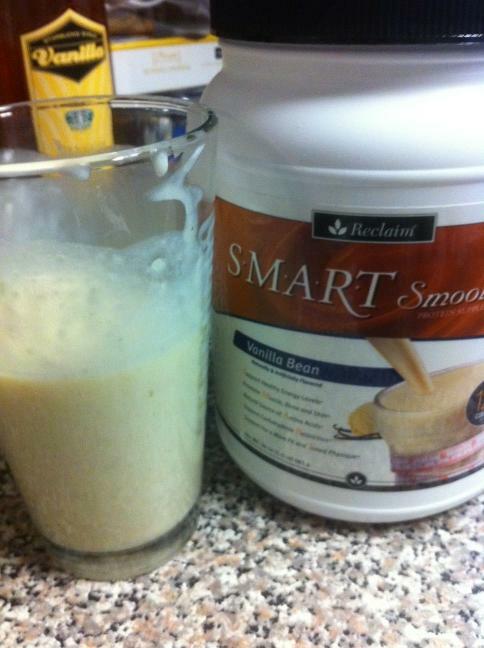 Pour shake into glass and stir vigorously with spoon to ensure powder is well-mixed in.